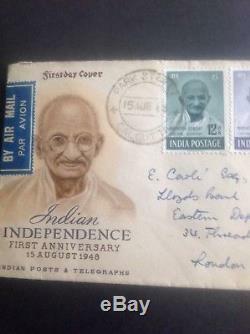 INDIA MAHATMA GANDHI FIRST DAY COVER 15 AUGUST 1948 POSTMARKED PARK STREET CALCUTTA. Slight rubbing on the Rs 10 stamp. Rare cover hard to find. Please see scans which form part of the description. Happy to provide further scans if required. 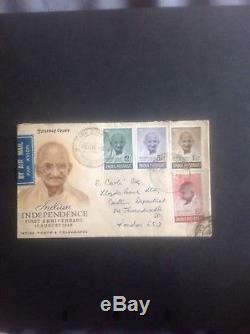 The item "INDIA 1948 MAHATMA GANDHI GHANDI FULL SET TO Rs 10 FIRST DAY COVER FDC -RARE" is in sale since Sunday, August 12, 2018. 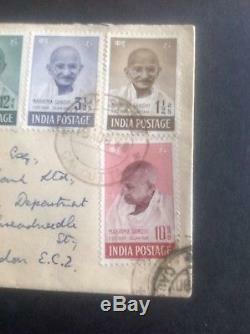 This item is in the category "Stamps\British Colonies & Territories\India (until 1947)". The seller is "jays2007" and is located in London. This item can be shipped to all countries in continental Asia, United States, European Union member countries, Canada, Australia, New Zealand, Norway, Switzerland, Chile.